Huntley Fitzpatrick is one of those authors whose works are super popular but not necessarily super well-written. From My Life Next Door to The Boy Most Likely To, each of her books has countless fans who promote her work like crazy. After reading and not hating The Boy Most Likely To, I can understand why Fitzpatrick has so many fans. The teens in her novels seem like real people with real issues, not to mention that Fitzpatrick has glittering prose and a legit sense of humor. Tim Mason is The Boy Most Likely To find the liquor cabinet blindfolded, need a liver transplant, and drive his car into a house. Alice Garret was The Girl Most Likely To…well, not fall for baggage-burdened, and not to mention younger, Tim. For both Tim and Alice, it wouldn’t be smart to fall for each other. But they do, and then the unexpected consequences of Tim’s wild days come back to shock him. He finds himself in a situation that isn’t all that it appears, that maybe isn’t even his situation in the first place. But it’s his and Alice’s situation to deal with. While I liked both Alice and Tim as characters, I didn’t like them as a couple. The romance happened too quickly and unconvincingly; I still don’t understand why Alice ended up falling for Tim. And all I remember Tim truly noticing about Alice was her apparently gorgeous body (if there was more, then shame on the book for not making it memorable). For a book that centers around romance, an unsatisfactory romance is a pretty bad sign of the book’s quality. 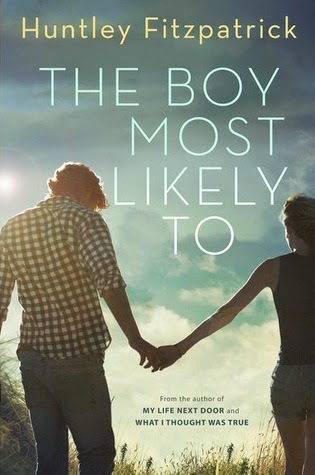 On the other hand, other aspects of The Boy Most Likely To are done relatively well. The prose is compelling; I love the fact that Tim and Alice have completely different personalities. There’s a lot of contrast and interesting perspectives as a result. Plus, there are a lot of references to characters in My Life Next Door, so all fans will be super pleased. Although I probably won’t reread this book, I’m definitely going to be checking out Fitzpatrick’s other works. Valerie is sixteen. She attends a boarding school near Boston, where she writes, reads, and attempts to be a studious student. She's too lazy to write the rest of this bio, so follow her on Twitter @torquoiseworld because shameless self-promotion is alive and thriving!